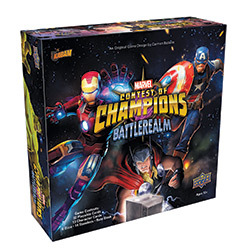 Upper Deck will release Contest of Champions : Battlerealm, a combat and strategy game based on Kabam�s mobile fighting game Marvel: Contest of Champions in Summer 2018. In the game, designed by Carmen Bellaire, players take control of a Marvel character, roll their dice to activate the character�s powers, and travel to different locations to gain points or take points from other players. The mobile game is loosely based on Marvel Comics� Contest of Champions miniseries by Mark Gruenwald, with art by John Romita, Jr. and Bob Layton, where the Grandmaster and Death play a game to decide the fate of the Collector, using various superheroes from Earth as pawns to collect pieces of a prize (see "Marvel Gets Meta With 'Contest of Champions'�). The box contains 92 playable cards, 13 character cards, 14 standees, 6 dice and a rulebook. The game is for players 3 � 6 players, ages 12 and up, and plays in 30 � 45 minutes.